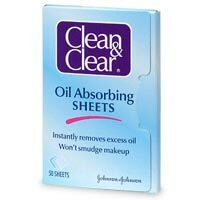 The Product of the Week goes to Clean&Clear’s Oil Absorbing Sheets. If you have oily or combination skin these are a lifesaver. Pat the sheet around your t-zone and watch the shine and oil transfer from your face and onto the wipes. Don’t worry about ruining your makeup because the wipes don’t remove it.